There are quite a few South African’s on etsy and I think this is TERRIFIC! CandyDesign is a team of two sisters who create the most beautiful invitations, announcements, greeting cards, stationery, original prints and other pretty gifts. 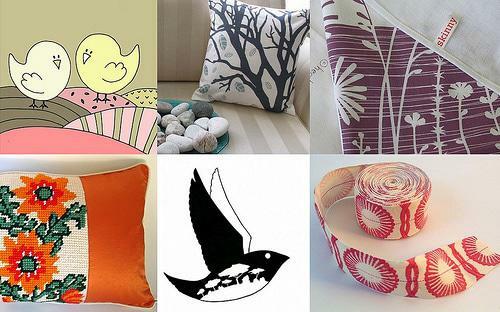 Colleen Roberts from DizzyDezign is also a textile designer by paper and in her shop she sells her designs printed and embroidered on teatowels, cushions, and pillowcases. Heather Moore from Skinnylaminx sells printed brilliantly designed and coloured teatowels, aprons and cushion covers. Freshly Found loves to find vintage or interesting items such as silk suits, pots and pans, baking sheets – you name it, Freshly Found has found it and given it a new and exciting life. Jesse Breytenbach has two etsy shops: Jezzeprints which sells prints of her drawings and comic art and Jezze’s Shop which sells her block-printed cotton tape, knitted and crochet brooches and gorgeous coin purses. This entry was posted in Blog and tagged Candydesign, Craft, dizzydezign, Etsy, Jezze, Skinnlaminx, South Africa, South African Design. These are such cool shops! Thanks for sharing. these designers are great, I love the work of heather from skinny laminx.